There will always be new trends. But if you aren’t paying attention to job search news, you’ll get left behind or left out! This week’s summary has interesting information about the future of resumes, job search tips and how social media is being used by employers and how YOU can use it for research too! Thanks to Dorothy Dalton for bringing this article to my attention! I think we all can agree that the resume is certainly NOT the best tool to convey all the great things you can do and have done. This article takes a look at all the problems with resumes and some of the solutions to hiring that are being used today. It’s a long read, but full of nuggets! You will have more than one interview. The tricks to succeeding in the second interview are revealed in this article. Interviewing is a process you’ll need to understand! Sleuthing companies through social media offers great insight, in most cases. See what you can learn about companies on which platforms (LinkedIn, Facebook, Twitter and Instagram) AND how to use the information during the job interview. When a company writes an article and publishes it on their careers page you know it’s important. See what Vanguard recommends you do to polish your personal brand on social media! Are you boring, a poor interviewer or coming across as desperate? Any one of these things could be why you’re not making it through the interview process. Learn how to fix these problems! Fast Company says “Just 29% of hiring managers look at an applicant’s LinkedIn profile, while 38% search for social media accounts” according to a recent SimplyHired study. This should be a lightbulb moment for every job seeker. Jobvite’s newest Job Seeker Nation Report was recently released. I break down some important findings and how job seekers can fix the issues. 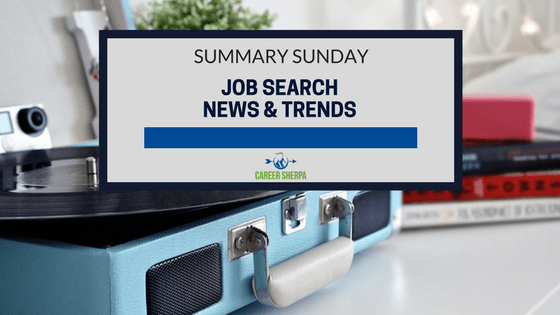 The post Summary Sunday: Job Search News & Trends appeared first on Career Sherpa .